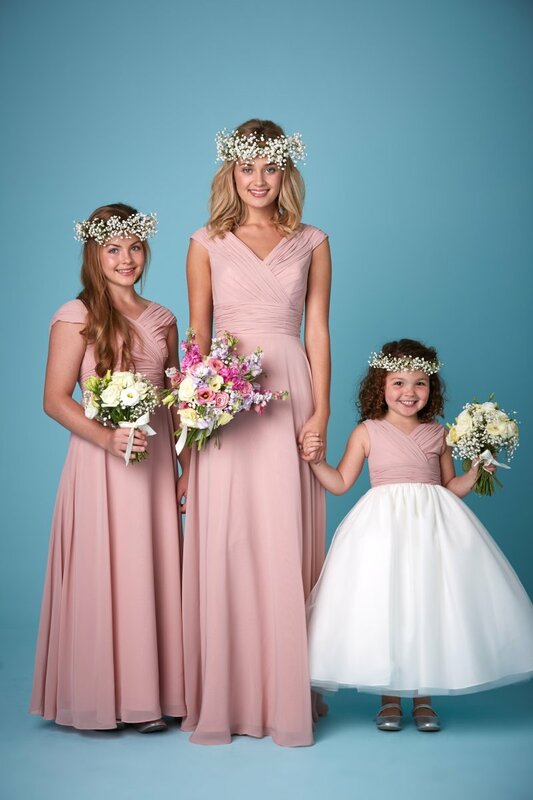 We are now proud to offer stylish and affordable bridesmaid dresses by Amanda Wyatt that look and feel fabulous! 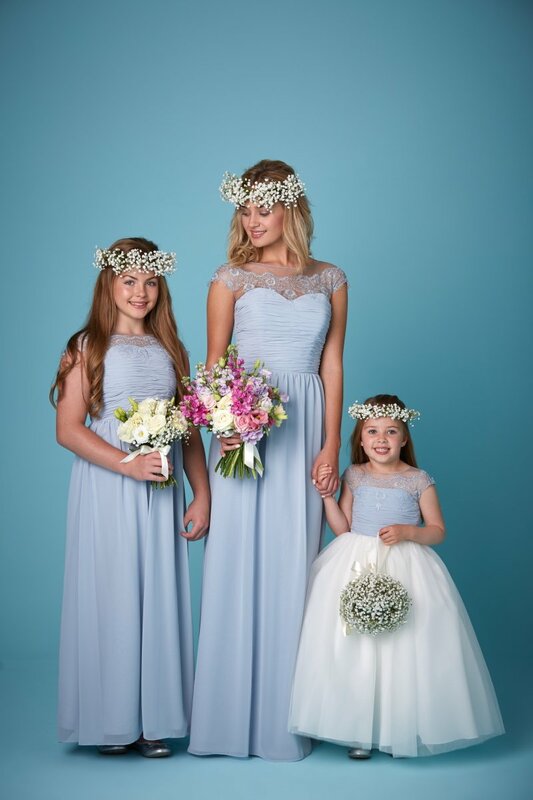 Our bridesmaid and flower girl dresses are all made to order so we can create a beautiful wedding party combining styles, colours, and sizes for that perfect blend. Each style is available in any of our fabrics from Chiffon, for a lightweight, soft & flowing feel, to Lace and Satin and in any of our 30 colour shades. We want the whole party to feel beautiful and comfortable. With a whole range of choices, it’s easy to find something for everyone, whether short & chic with skirts that move with ease from the ceremony to the dance floor or long & lovely with hemlines that touch the floor and give a graceful feel that’s a little more formal. The inspiration for your wedding palette can come from anywhere. 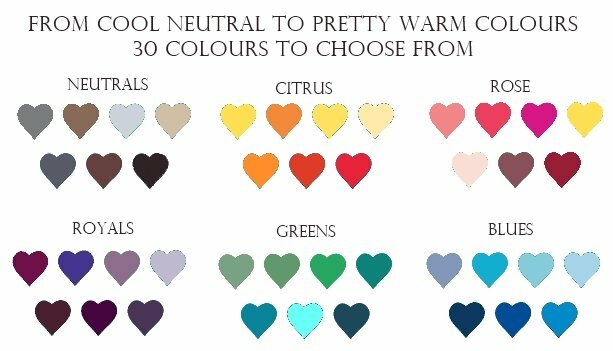 We have 30 shades from which to find the perfect colour for your wedding. Then think about style – dressed alike, everyone looks lovely together. But why not consider one of our colours but in different styles for a more informal look or one of our styles in a mixed spectrum of similar shades. 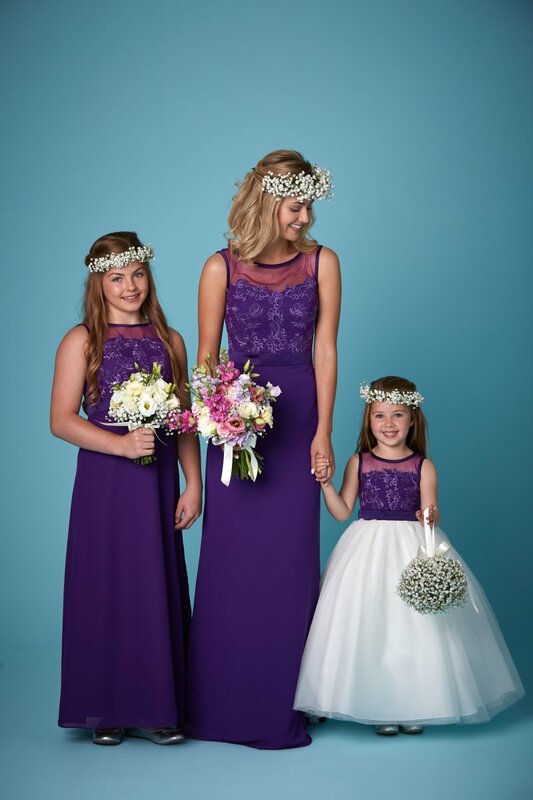 We know bridal parties come in all sizes and some styles will suit some shapes better. 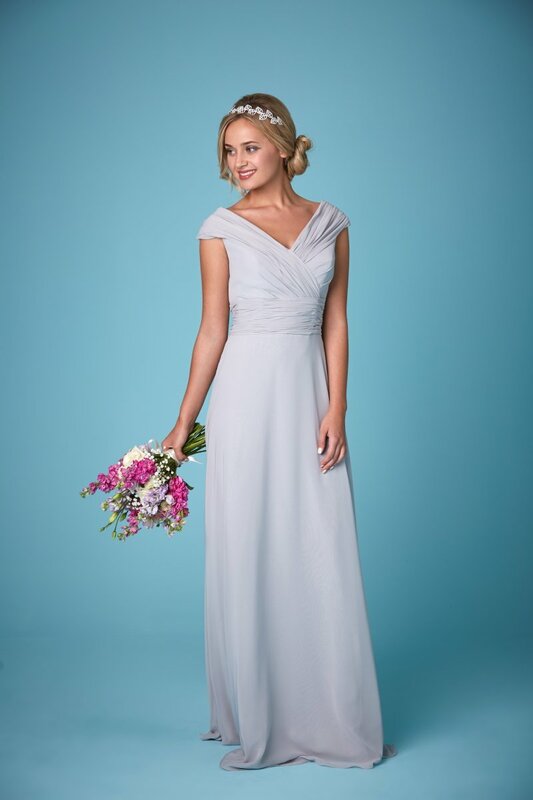 Because our bridesmaid dresses are made to order, our options are much greater. Our in-store seamstresses are here to ensure that perfect fit. 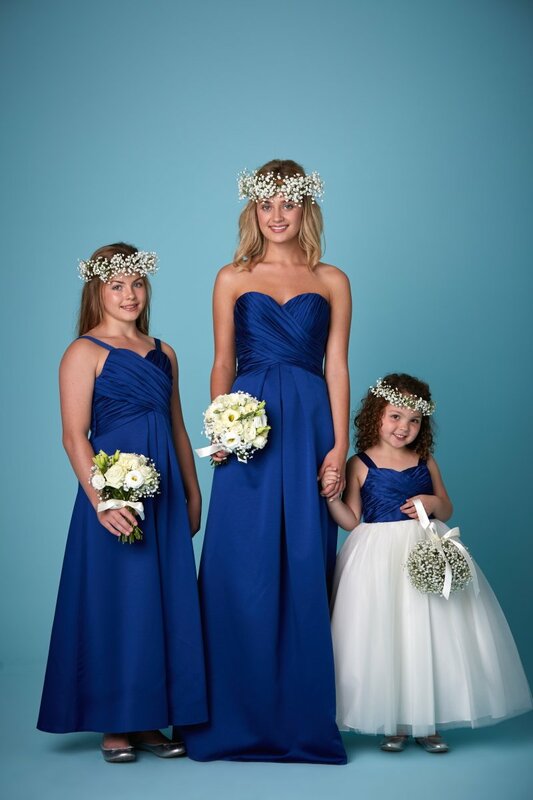 2193 Strapless gown shown here in cornflower satin. Available in satin, chiffon or tafetta and a range of over 30 colours. lace up back in the adults and teen and boning throughout. 2265 Bridesmaids gowns with embroidered bodices. Available in satin, chiffon or taffeta and a range of over 30 colours. Zip back and boning throughout. 2261 Bridesmaids gowns with embroidered bodice with chiffon skirt. Shown here in amethyst and sky blue. Available in a range of over 30 colours. Zip back and boning throughout. 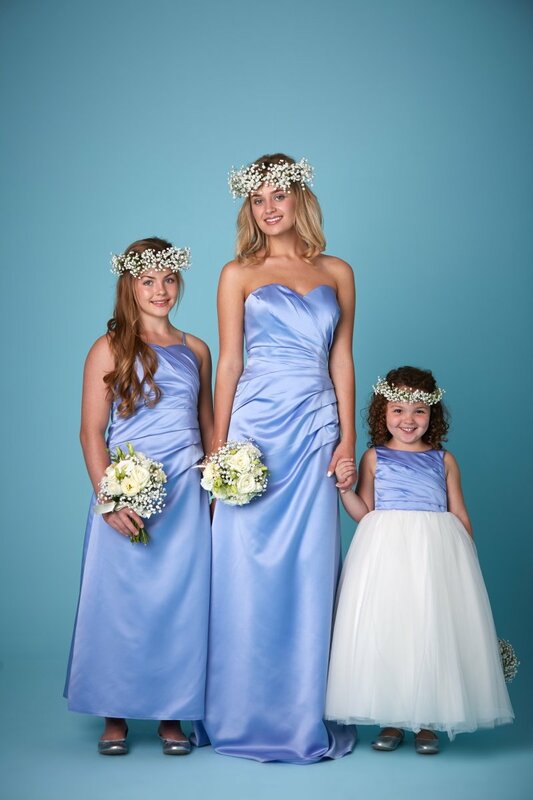 2262 Bridesmaids gowns with wide straps which can be worn on or off the shoulder. 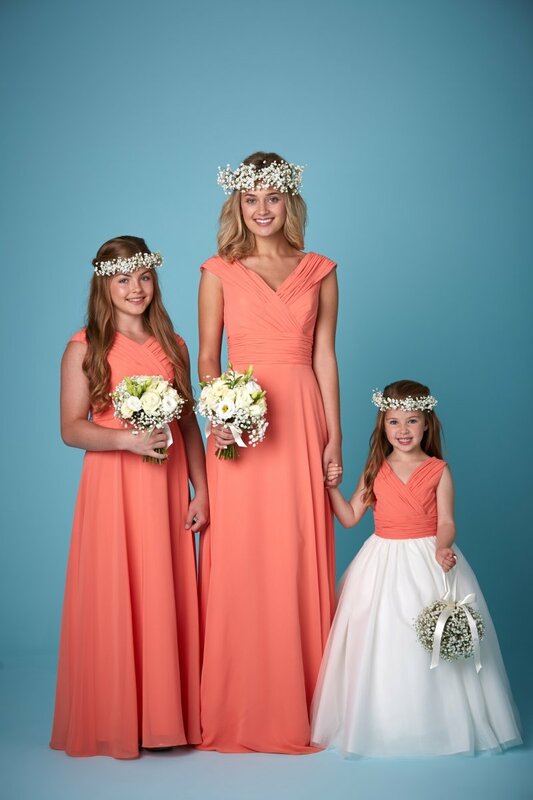 Shown here in coral chiffon, clover pink chiffon and oyster grey chiffon . Available in chiffon, satin or taffeta and a range of over 30 colours. Zip back and boning throughout. 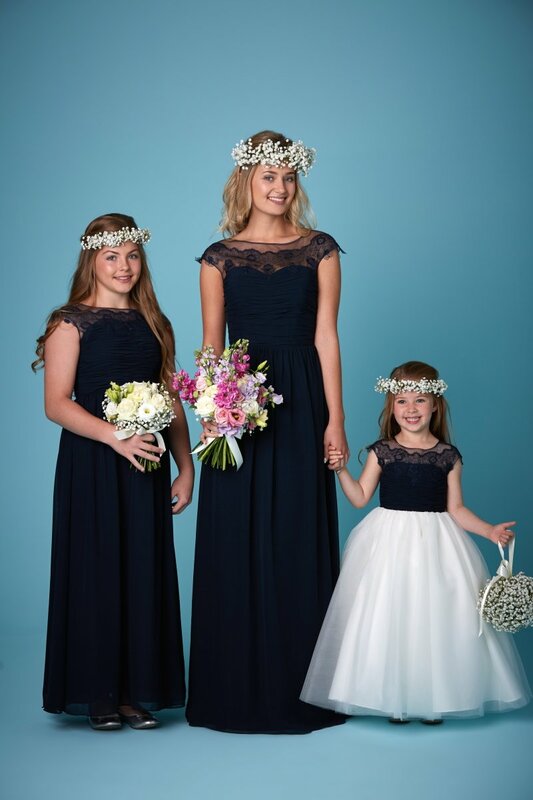 Teens in age 10 -15 years and Flower girls in age 2-10 years £130. Adults in sizes 4 – 30 £199* . 2211 Strapless gown shown here in raspberry chiffon and royal blue satin.